The cherry plum is one of the numerous kinds of plum. 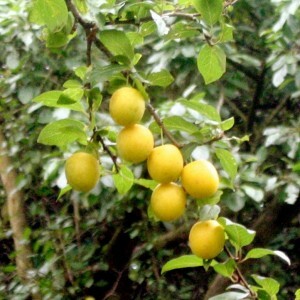 The Latin name of this fruit crop is Prunus ctrasifera Ehrh. It is often possible to hear other names of this berry, for example, "the plum which is spread wide" or "myrobalan". As "relatives" of a cherry plum, it is also possible to consider and such fruit crops as an apricot, a peach and felt cherry. Some gardeners even manage to grow up trees with different branches, but, unfortunately, such hybrids not always get accustomed and don't differ in good health. Why the cherry plum is so popular? The answer is simple: this culture is one of the most unpretentious. The proof to it is that fact that the cherry plum grows on the most different soils – from gravel and sandy to carbonate and gray forest. The cherry plum arose long ago, still B.C. inhabitants of Transcaucasia and Forward Asia were engaged in its cultivation. But gradually the cherry plum extended out of limits of the habitual area. And today this culture which was once considered suitable only for cultivation in the south is cultivated successfully in the most different countries – in Russia, in the Ukraine, in Greece, in Turkey, in Bulgaria, in Iran, in Italy, in France, etc.